I am the one who asked about Jruby On Android progress at Rails Underground, and glad to hear the progress. Since I asked, I am more than happy to become guinea pig. I got your code from github and tried to set it up, but got various warning and error message. Could you let me know if I did anything wrong (I don't know much about Java, so might be doing some fundamentally wrong)? Then proceed from the "ant release" step. Bob, Elliot: I reported it informally on the android platform mailing lists, but I probably never reported it formally. My original email includes the issues that remain in android 1.5, but I can't seem to find it in the archives. I will endeavor to report the issues I've found today. It might be a bug in iterating >64 element enums. That's fixed in an upcoming build. the next release of ASE (http://code.google.com/p/android-scripting/) will support JRuby with irb, too. I wrote the JRuby support last week and encountered only one minor problem (eclipse complained that the jar contained an html file it did not like. I think it was doc/index.html but don't remember and can't access my code right now, will send a patch for build.xml). BTW, you don't have to patch the dx tool, you can start threads with larger heaps from within an Android application (see the different Thread constructors). Thank you for your advice. I tried your suggestion and it's working on my device!! Took about 5 sec to load up and crashed once, but still it's great achievement. 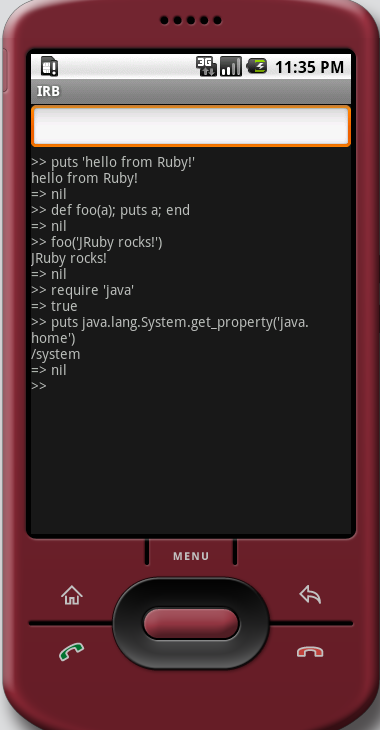 Looking forward to code full Android app in Jruby. Here is the full output when I tried. NOTE: I could not run it on emulator, but probably it's problem on my env, ad I could not run other app on emulator at that time. Very cool. I've forked the git repo (http://github.com/Neurogami/ruboto-irb/) and made a few metadata changes to help folks like me you develop at the command line with vi.